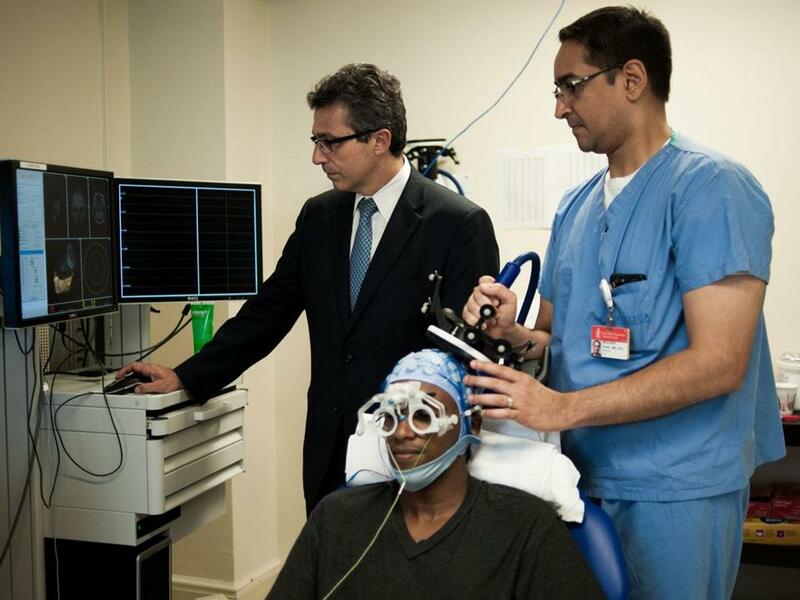 Dr. Alvaro Pascual-Leone (near right) and Dr. Mo Shafi use magnetic stimulation technology to observe brain function on a study participant at Beth Israel Deaconess Medical Center. About 18 months ago, Hope began forgetting things. She started leaving details out of her conversations, speaking in vague, positive terms that seemed to fit every situation. More and more, the sparkle in her eyes gave way to a vacant stare. Hope, 73, who asked to be identified only by her middle name, was diagnosed with Alzheimer’s. There is no cure for the memory loss, confusion, and fear of Alzheimer’s; in the best scenario, medications can delay the deterioration for a little while. Unwilling to despair, Hope’s husband, a retired business executive, signed her up for an experimental treatment: brain fitness training. Although scoffed at for years, such “training” — which traditionally has meant specialized computer games but now includes a more comprehensive, whole-body approach — is gaining currency as a viable treatment for brain conditions and a hedge against normal aging. There are six essential components to a brain fitness program. A growing body of evidence suggests that a “trained” brain will be better equipped to work around damage caused by disease, injury, deficits, or aging — just as a physically fit person can better avoid and bounce back from injury. “If you’d asked me eight to nine years ago if I believe in cognitive training, I’d have said ‘pfft.’ But the research is quite convincing,” said Bonnie Wong, a clinical neuropsychologist at Beth Israel Deaconess Medical Center, where Hope is getting her care. Wong and her colleagues are starting what they envision as a gym for the mind, offering brain training exercises — including specially designed computer games — as well as nutritional and lifestyle coaching, social opportunities, and classes in meditation, music, and yoga. The Brain Fit Club, which officially opened this month and already has a waiting list, is one of the first efforts to put this research into practice in a supervised setting. “I think that’s going to be a real example for everyone else to learn how that model can work,” said Alvaro Fernandez, CEO and cofounder of SharpBrains, an independent market research company tracking health applications of brain science. At first, the Brain Fit Club, which Wong runs, will be available only for existing Beth Israel Deaconess patients who have Alzheimer’s, mild cognitive impairment, concussions, or ADHD. These patients will be studied as they “work out” to see which approaches are most effective for each condition. Every weekday from late May through June, Hope’s husband drove her from their Cambridge home to the hospital for her training, which is part of a clinical trial. Hope played computer games while staff stimulated her brain with magnets to see if it would help her to learn more effectively. “I’ve seen some changes in my wife’s abilities,” her husband said, from the waiting-room chair where he’d sat every day. “I haven’t really fallen apart,” she answered, maintaining the easy banter the two honed over decades of marriage. Though it’s too early to know what kind of training will be most effective, there’s already strong evidence that Beth Israel Deaconess’s multi-prong approach can make a difference, said Dr. Adam Gazzaley, a professor of neuroscience at the University of California, San Francisco. “I just don’t think that given the complexity of the brain we can hope to treat it effectively with a single modality like a drug,” he said. In recent years, Gazzaley said he’s increasingly directed his research lab toward making targeted computer games aimed at boosting specific brain skills. His most recent research shows that the brain is flexible enough, even in old age, to allow people to learn from well-designed computer games. One essential element, he said: The games have to be fun. “I think fun is a core component of the effectiveness of these treatments,” Gazzaley said. People will be more likely to stick with a therapy if they are enjoying themselves, he said, and when we feel pleasure, our brains release chemicals that may aid in learning. Brain training must also be challenging, pushing people to learn new skills and think in different ways. A lawyer might want to take an art class, for instance; an artist might opt to do their own taxes, Fernandez said. If you already know a second language, perhaps pick up an instrument or learn to knit. Scientists used to think that as we aged, our brains lost their ability to adapt and change. Now we know that the brain retains some “plasticity” throughout life, and can learn to work around deficits at any age, according to Donald Stuss, president and scientific director of the Ontario Brain Institute, and a professor at the University of Toronto. But as we get older, we tend to reinforce what we already know, instead of trying new things that will challenge our brains. Even a scientist’s daily life isn’t challenging enough for the brain, said Dr. Alvaro Pascual-Leone, a neurology professor at Harvard Medical School who said he “cross-trains” himself by doing some of the computer games. Pascual-Leone said he thinks most of the off-the-shelf games are just fine, but they don’t come with instructions about how often they should be played or who would benefit most from which game. Patients in the Brain Fit Club will probably start out with intensive programs like Hope’s — extended workouts every day for a number of weeks, while participating in classes and stepping up their physical exercise. The social aspect of the club is crucial, said Wong, adding that research has repeatedly shown that social interaction is a key ingredient for brain and heart health. Physical exercise, including aerobic activity, has also been deemed essential to healthy aging. After an initial intensive program, overseen by Wong and club staff, it is hoped that participants will maintain their gains while working out at home and checking in periodically, Wong said. The ability to work out the brain at home makes computer programs particularly valuable, said Sheryl Flynn, CEO of Blue Marble Game Co., of Los Angeles, which develops brain training programs. Plus, without disease-altering medicines to treat conditions like Alzheimer’s, the idea of brain fitness offers some hope, with no side effects and for a limited cost. “If this works out . . .” Hope’s husband started to say. “I think it’s working out,” Hope interrupted. “. . . so many millions of people will benefit as time goes on,” he added. For his own wife, Hope’s husband just hopes for as many more good years as possible. “As long as, at the end of the day, my wife has got improvement in her ability to enjoy life. That’s the whole thing,” he said.